I made these on Thursday, but couldn’t blog them at that point because I ate so many that I felt sick. And now I wish I had another pan so I could eat some more while I type. I know coconut is a love-it-or-hate-it thing. Clearly I love it. I chastised Kevin for not saving any Almond Joys and/or Mounds from his Halloween stash for me to eat over Thanksgiving. (“I’m sorry Erin, I forgot you liked them.. I only had one.. I gave it to Dad.” Yeah, yeah. My phone chats with Kevin make my week. We usually talk on Monday and Wednesday nights, and we’ve been counting down until when I come home for Thanksgiving for approximately 8 weeks now. Only 10 days to go! Usually our topics of interest include: fourth grade blues, Dancing with the Stars, the list of things he wants me to bake for him over Thanksgiving/Christmas/2013 (it’s getting extensive) and CYBA basketball rosters. “This new kid on my team is as tall as me, but he is brick wall.” Yes Kevin, you might want to bulk up- all 65 pounds of your skeleton won’t be knocking anyone down. And case you’re wondering, it was Nancy Grace’s time to go. Crush the graham crackers in a food processor or blender, or whack them with a rolling pin in a ziplock bag. Depending on your mood. Melt the butter (or brown it, if you’re jumping on Sheila’s crazy train) and mix with the graham cracker crumbs, sugar, and salt. I just mixed it with my fingers until all the crumbs are evenly coated and it can be pressed into the bottom of a 13 x 9 pan. Bake at 350 for 5 minutes or until the edges are just barely browned. 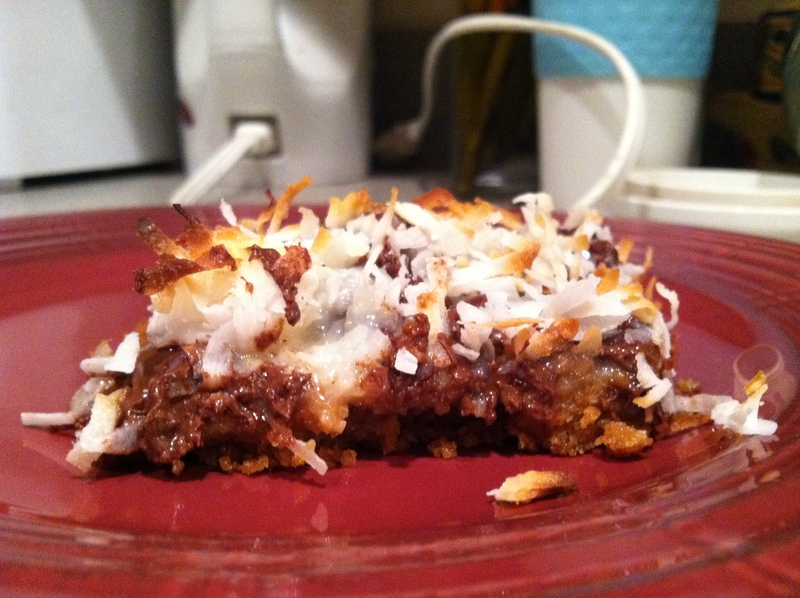 Top with an even layer of chocolate chips. I used a mixture of semisweet chocolate chunks and mini chocolate chips, because they didn’t have regular chocolate chips on my field trip to Giant. Same thing. 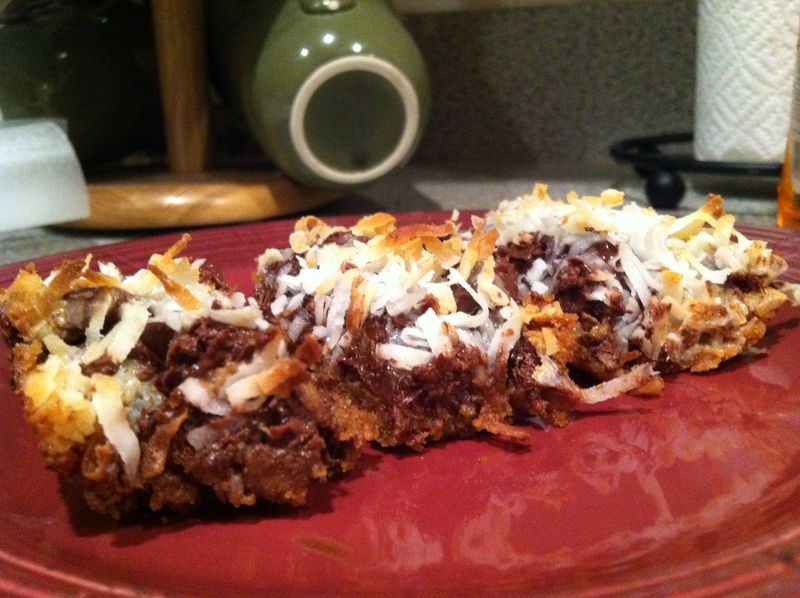 Pour the sweetened condensed milk over the chocolate, then spread the coconut on top. 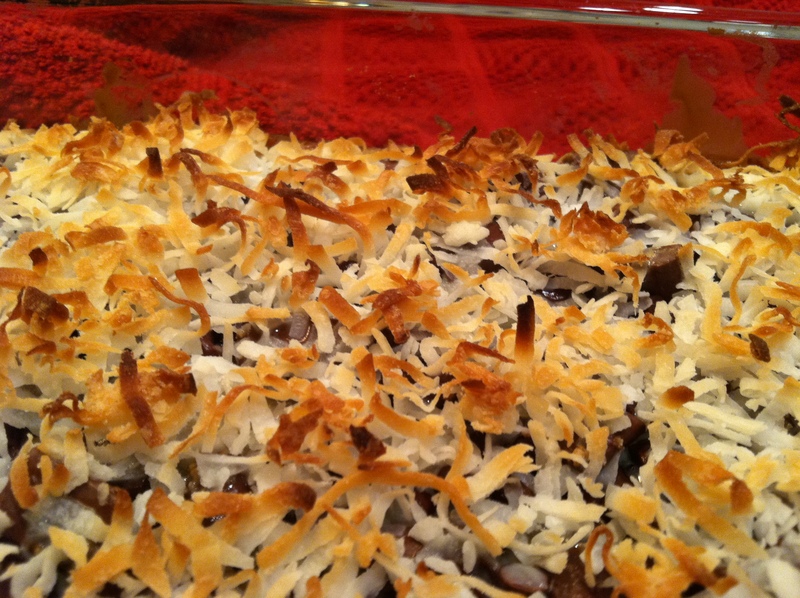 Bake at 350 for another 12-15 minutes or until the coconut is browned. Even though I know these are supposed to set up in the pan, I scooped one out and ate it with a spoon because we know about my self control issues. Then I packed the rest up and brought them to school to share, because I’m a housewife. I was informed that these will not be added to Kevin’s list at slot 17, because he doesn’t like (has never tried) coconut. I’ll keep that in mind with my future recipe selections.